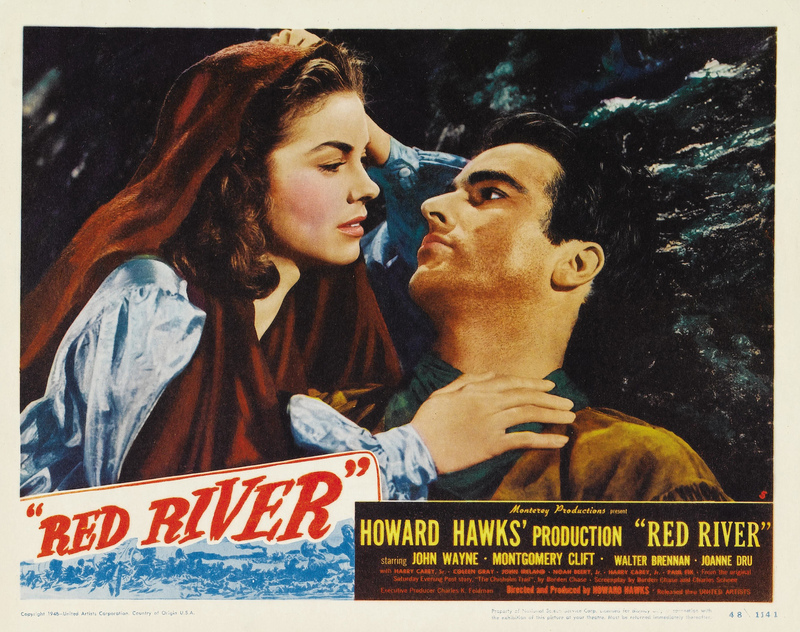 Although it wasn’t released until late September of 1948, about 6 months after the release of The Search, Howard Hawks’ western Red River was actually Montgomery Clift’s first experience with filming movies. It was a trial by fire, or maybe by water. The film was shot in Rain Valley, east of Tucson Arizona, and during filming it rained nearly continuously for six weeks. Many of the actors got sick with colds. Scenes had to be rewritten to accommodate the weather. 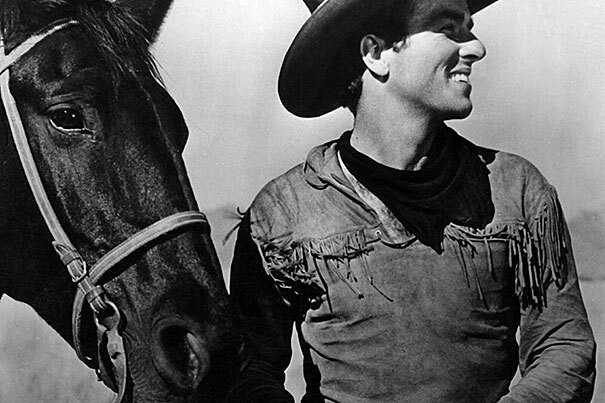 Monty had little experience with riding and none with cowboy work prior to filming, but with typical intensity he set about learning. 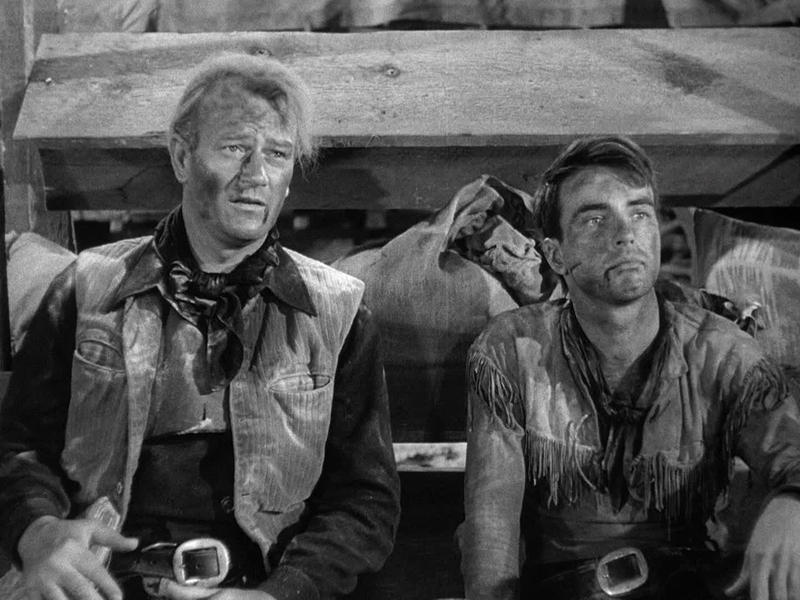 “He came down two weeks early and went out after breakfast with a cowboy, taking a lunch with them, and they rode all day long – up hills and down steep places, and through water and so on,” Howard Hawks told Peter Bogdanovich in an interview years later. “And by the start of the picture he really rode well. You could tell that. And I taught him a little jump step to get into the saddle – he’d make a little hop into the stirrup. He worked – he really worked hard.” Asked if Clift was ever difficult to work with, Hawks replied “Oh, nobody that good is difficult.” His later directors would beg to differ, but at this point in Monty’s life it was true. In the end the lousy weather, illness, and macho games were worth it, however. Red River is a beautiful, complex western that’s entertaining from start to finish – a skillful blend of action, humor, romance, and drama. 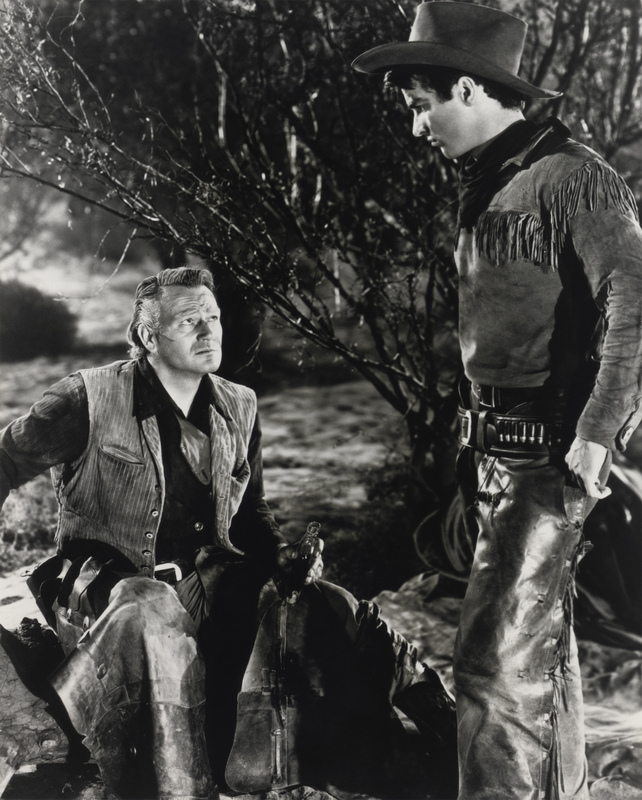 The film also excels at pitting two different life and leadership philosophies against each other in the characters of John Wayne’s hardened cattle rancher Thomas Dunson, a man who shoots first and lets God sort out the souls, and Dunson’s foster son Matthew Garth (Clift), a skilled sharpshooter who returns from the Civil War preferring to act out of mercy, good judgment and, whenever possible, non-violence. As the movie begins Tom Dunson is leaving a wagon train along with his friend Nadine Groot (Walter Brennan), heading to Texas with little more than a bull to his name in hopes of starting a cattle ranch. Despite her protests he leaves the girl he loves (Coleen Gray) behind with the train, promising to come back for her once he’s settled. Unfortunately that plan is not to be, since soon after Dunson departs the wagon train is attacked by Indians. They wipe out everyone but a teenaged boy named Matthew Garth, who managed to escape along with a cow he was searching for when the Indians appeared. When Matt proves his worth by standing up to Dunson, he takes the boy on as his responsibility. “He’ll do,” he tells Groot with grudging approval, and they all head out together for Texas. Dunson admires the backbone young Matt shows, and his ability to think for himself. In time those qualities will tear the two of them apart. Years pass and Dunson’s Red River D ranch is large, if no longer prosperous. He’s killed and buried many men who tried to take his land away, giving everything including perhaps his soul to make the place a success, but the Civil War has left the South’s economy in tatters. His cattle are no longer worth a thing in Texas. Now that Matt has returned from fighting, Dunson plans to lead a cattle drive to Missouri, where he believes he’ll be able to sell the animals for beef at a good price. To Dunson he says “You’re gonna wind up branding every rump in the state of Texas except mine.” For now they’re able to smooth it over, Dunson threatening to put the iron to Matt, Matt laughing off the thought that Dunson would really do it. But as the cattle drive gets underway, Dunson’s mania to get the cattle to Missouri regardless of the human cost drives a wedge further and further between the two men. Dunson threatens to brutally whip a hapless cowhand who started a stampede, costing a fellow cowboy and many of the cattle their lives. He’s only stopped from killing the man when Matt pulls out his gun and intervenes. When talk among the men turns to their desire to drive the cattle to Abilene, Kansas instead of taking the more difficult and dangerous trek to Missouri, an idea Dunson refuses even to consider, several of them threaten to leave. Dunson shoots and kills the “quitters,” much to Matt’s revulsion. On Dunson drives the men, past the point of exhaustion and common sense. For Matt the final straw comes when two men who stole supplies and ran away in the night are brought back to Dunson by cowboy Cherry Valance (John Ireland). Dunson plans to hang the men for theft and desertion, but Matt has had enough of what he sees as senseless killing. He stops Dunson and easily gets the demoralized cowboys to join him in a mutiny, taking over the herd and promising to take them all on to Abilene himself. Betrayed by the man he saw as a son and to whom he planned to one day leave everything, Dunson promises Matt that he’ll follow and kill him. The rest of the movie unfolds suspensefully as Dunson gathers a gang to follow Matt and the cattle drive, while Matt tries to stay several steps ahead. Matt hopes that once he’s successful in selling the livestock and has money to hand over, Dunson will see sense and relent. The pain for him is that he believes in his heart the man he loves like a father will never forgive him, even though he did what he had to to salvage the herd and stop the violence. For all the serious moments in Red River, the movie is also funny at times. Much of the comic relief comes from the always memorable Walter Brennan as Nadine Groot, the toothless cook whose pronouncements are hard to understand unless he puts in the store-bought teeth Matt brought him after the war. There’s also a good amount of lust and romance – enough for whatever floats your boat, in fact. 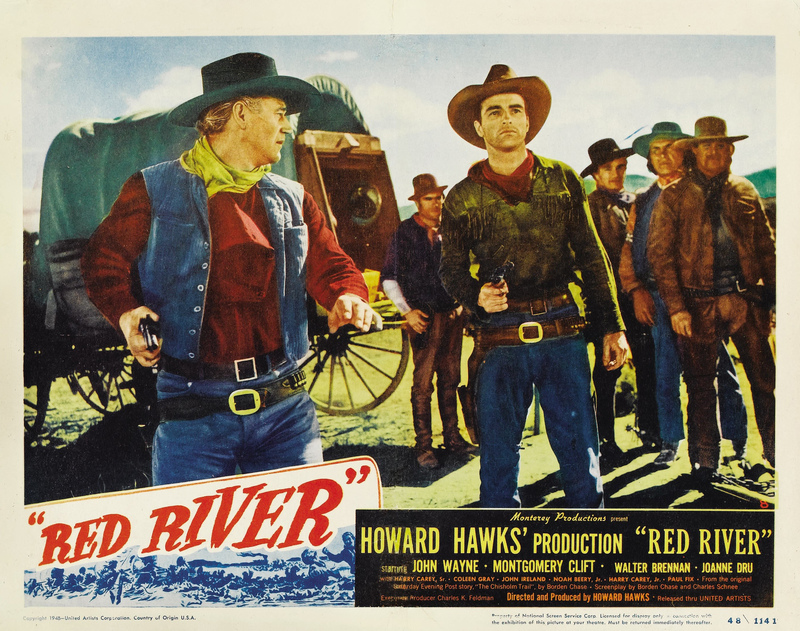 Red River is famous for several scenes of homoeroticism surprisingly blatant for the day, and particularly shocking for their inclusion in a John Wayne movie directed by Howard Hawks. The heat generated between Montgomery Clift’s Matt Garth and John Ireland’s Cherry Valance is almost visible on the screen as they examine each other’s guns, eye each other warily but with great interest, and sit around the campfire talking quietly at night. At the same time, there’s plenty of heat between Clift and his actual love interest in the movie. Joanne Dru plays Tess Millay, a beautiful spitfire Matthew meets while rescuing her wagon train from an Indian attack en route to Abilene. Tess is an archetypical Hawksian woman – able to hold her own with men in a game of cards or a battle of wits, tough enough to take an arrow through the shoulder without flinching or crying out, yet able to make her man feel like a man when the chips are down. Dru’s scenes with Clift are terribly steamy as they talk and kiss in the rain, and later spend a night together before Matt finally has to face down Dunson and either kill or be killed. Watching Montgomery Clift act is quite simply a pleasure. I constantly marvel at the little bits of business he adds to his scenes. Lighting a cigarette to perfectly punctuate a moment. Letting a small smile flicker across his face, or a look of anxiety subtly cross his brow. Pushing his cowboy hat up just so, or gently bumping into a lamp in his erotically-charged haste to take a woman in his arms. Small moments like those were labored over painstakingly in the margins of his scripts and in rehearsal with his acting teacher, Mira Rostova, but show absolutely no air of study at all in the execution. It’s the same with the way he says his lines – the inflections, the pauses, the way he uses his voice. He’s one of the most natural, believable actors I’ve ever seen. He simply is the character he’s playing. I never stop feeling awe when I watch him in a role, whether one from his late 1940s – mid-1950s heyday, or one from the post-accident years when he was struggling with life on and off the set. It doesn’t matter. His talent is always so apparent. 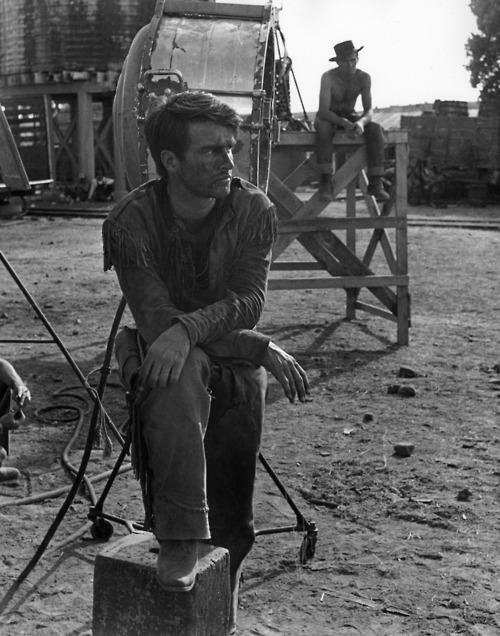 As for his own opinion, Clift thought he was mediocre in Red River, and that the movie itself was awful. He hated the watered down ending, re-written so that John Wayne’s character wouldn’t die, and he hated that the conflict which had built to a fever pitch by the end of the film was resolved in a moment of anti-climax, with Tess Millay breaking up the fight between Dunson and Matt. 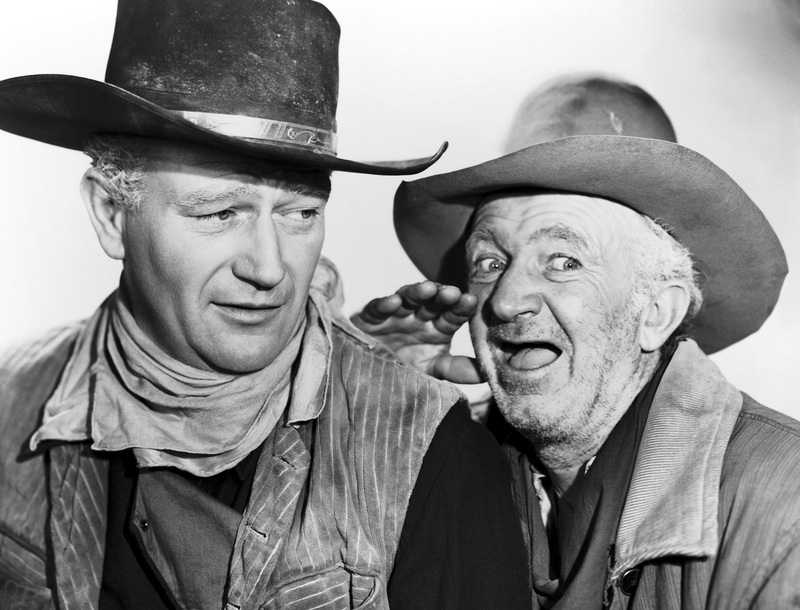 “It makes the showdown between me and John Wayne a farce,” Monty said. I tend to agree with him on that one point – the end does feel like a letdown and a cheat after all the drama – but as for the rest of the movie, I think it’s brilliant. From the strong performances by both Wayne and Clift, to the gorgeous cinematography by Russell Harlan, to the sweeping score by the great Dimitri Tiomkin, the movie is completely entertaining and thought-provoking. Who is the real man, the one who fights, bullies and kills in order to get what he wants, or the one who has the courage of his convictions and isn’t afraid to have compassion and a soft heart? What kind of person makes a true leader, the one with a violent my-way-or-the-highway attitude, or the one who favors discussion, collaboration, and respect? These kinds of questions permeate Red River as they were permeating the way men in a post-World War II world looked at themselves as they re-integrated into civilian life. In his embodiment of a kind of masculinity that could be both strong and tender, both physical and cerebral, Montgomery Clift seemed in 1948 to be the man of the moment. I’ll be back soon with Part 3 of this look at Monty in 1948, with a review of one of my favorite of his movies – Fred Zinnemann’s The Search.